Kate Scardifield, "Going into Theatre I", 2010. When I stepped into Kate Scardifield’s solo exhibition, The Whole and the Sum of its Parts, I was overcome by a sense of déjà vu and not just because I’d seen her work exhibited before. Looking at Scardifield’s life-sized silhouettes of women, cut from fabric and sticky vinyl, I couldn’t help thinking: Sally Smart anyone? Sally Smart, from the "Exquisite Pirate" series, 2006. So I guess I was a little disappointed (but, I confess, not surprised) to see Scardifield was still at it some 18 months later. Had no one thought to mention Sally Smart’s work to her? Or does she know and just not care, finding sufficient discrepancies in her own mind to justify the striking similarities? I don’t know the answer. And either way, I strongly believe that the onus for drawing this kind of artistic coincidence to the attention of artists is on curators, critics, gallery directors, academics, funding bodies, et al. Not the artists themselves. Artists deserve the benefit of the doubt. After all, an artist has to do what they have to do. You get the ideas you are given and you can’t know everything. But nobody (myself included, up to this point) seems to have said anything. In fact, in the year and a bit since I first encountered her Smart-ish works, Scardifield is doing quite well and emerging very nicely. 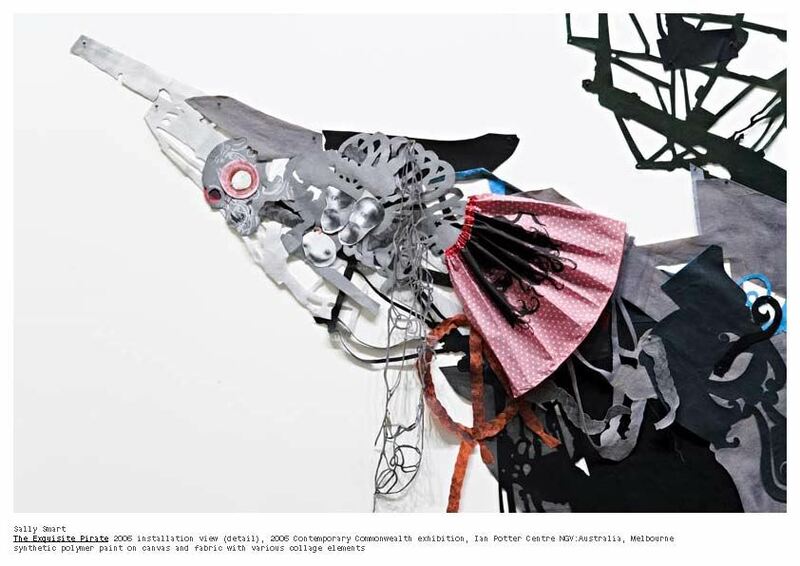 She has developed a public programme in collaboration with the MCA and has even won an OzCo Art Start grant. It seems that here in Australia, we like our art to look like art. And if that means sacrificing originality for familiarity, so be it. If visiting an exhibition brings on a sense of déjà vu, if it seems like we’ve seen it all somewhere before, that’s all well and good. This just means the artwork has already been given the ART stamp of approval. Of course Scardifield is by no means the first or the worst example of art déjà vu. It happens all the time. Poke a pin in the Aussie art scene at any given moment and you’ll find something familiar. Sometimes déjà vu even launches an international career. Aussie wunder kinder couple Sean Cordeiro and Claire Healy caught the local art-world’s attention in 2003 when they demolished a house and stacked it up in Sydney’s Artspace. But well known British artist Tony Cragg was already a master of the stack act. His Stack dates from 1975. In 2004, (perhaps taking their cue from pop princess Britney “Ooops, I did it again” Spears) the couple had another go. Same idea, different shape, and maybe this is enough? As I said before, I’m totally willing to believe Cordeiro and Healy had never seen Cragg’s work and came up with the idea independently. But somebody in the corridors of art world power would have seen his Stack. But this didn’t stop the couple from going on to way bigger and better things. In 2009, they waved the flag for Australia in Venice… Aussie Aussie, Oi! Oi! Originality optional. Kate Scardifield: The Whole and the Sum of its Parts is on at MOP until December 19, 2010. 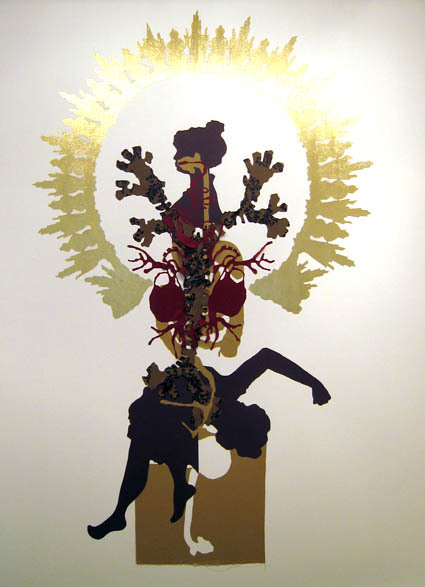 I still reckon the queen of paper cut outs has to be Sangeeta Sandresegar – her Bandit Queen series from 2003-2004 ROCKED. It’s funny because I have recently come to the sad conclusion that the surest way to become a ‘successful’ artist in Australia is to do a version of something that is critically acclaimed in the US or Europe. It seems many people, particularly curators, prefer something familiar to work with… after all it is easier to frame with a template to follow. titter. The Sally Smart look-a-like artist, I would hope, is knowingly working in a derivative style. How could she not be? She must be or needs to be ‘in conversation’ with Smart through the work, dedicating it to Smart and then taking it in her own direction somewhere. I think Cordeiro and Healy would have been familiar with Cragg’s stacks but they worked with the idea and took on their own trajectory much like Rachel Whiteread and her negative chair spaces after Nauman. Yup, nothing quite like a short cut to the official ART stamp of approval!! Thanks for your balanced comments! You may be right about Cordiero/Healy and Cragg, but I did interview them in 2009 and when I asked what their influences were, or who they admired, his name did not come up…. thank you tracey for your honest review, so refreshing to read. unfortunately, a lot of us cannot keep up with contemporary os art, so we have no idea when an aust artist is appropriating someone else’s work so closely. thanks for giving us the heads up. cheers. As I said, nobody expects the artist to know everything! I’m sure it is perfectly possible for 2 artists, at different times, in different places, to come up with very similar ideas! Why are we artists not required to quote our sources? Writers do, and they seem proud to demonstrate their impressive reading, the pedigree of their thinking. Visual artists seem to be somehow ashamed of their sources, perhaps because of the immense historical emphasis on individuality and ‘originality’ in the visual arts. But there is more to it; our sources are numerous and complex and jumbled together, eclectic and sometimes subliminal. Tracey, you are right to point out that the art curators and critics should be seeking out this story. I’m all for Investigative Curating! Artists should also take some responsibility, and alas, some are not above deliberate and exploitive plagiarism. Often those with a high profile take from those less seen. The times demand a change in visual arts culture. For example, a related point – artists who use a lot of talented help to make their work often fail to acknowledge it. Film-makers credit every single person involved in their project, right down to the person who makes the sandwiches. They find delightful ways to present the information, since the list rolls on and on. We in the visual arts are not yet very experienced in the collaborative approach. Good point. I once got raked over the coals by Patricia Piccinini for not mentioning the name of the guy who made her life-like sculptures in an article I wrote, but the irony was I really had tried! I knew she didn’t make the work herself and I’d looked for his name in every catalogue of her’s I could get a hold of at the time (this was several years ago) and online and I couldn’t find it anywhere! I don’t know much about this case in particular, but I wanted to share this vid – it’s somewhat related to your post. It makes the point that culture builds upon what came before. Culture is a great pyramid of ideas and creativity: artists can’t escape its influence, they will take from it to build their own work; and each time they create something, they are adding back to it for others. With this is mind, perhaps it’s not important as to whether Kate’s work is derivative of Sally Smart’s or whether she’s even heard of her. Kate’s work is still her own creation and it will go on to influence others. Art can’t avoid influence and it doesn’t develop in a vacuum. Also, great art is a successful balance between references/influences (which provides an audience with an ‘in’, giving them understanding); and originality (which is the bit that gets the audience excited). But, recognising originality is only a measure of an audience member’s knowledge of what’s come before. Of course…in our post-post modern age nothing is truly new, and everything is dependant on what came before. Nobody expects artists to re-invent the wheel every time! But I still reckon there is a difference between influence, appropriation (which is usually acknowledged and makes some kind of point) and plagiarism. Accusations of plagiarism are very serious and shouldn’t be taken lightly. I am familiar with Kate’s work and I would disagree that it is merely a derivative of Smart’s as you have suggested. TC, your comments appear to be less a review and more a somewhat nasty opinion piece- you don’t seem to have discussed any of the work in the exhibition, but rather made a sweeping statement based on the artists stylistic appearance and aesthetic. I became familiar with Kate’s work after I attended one of her workshops at MCA, I recall she openly discussed her influences such as Sally Smart, but also other artists such as Kara Walker and Miriam Shapiro, artists who employ cut outs, explore ideas around tableaux and engage with silhouettes. I would argue that Kate’s practice engages with and acknowledges artists working in a similar field, both conceptually and materially and I would also suggest that she is working towards a contribution to this field of art herself. The transgressive nature of art, particularly in contemporary practice, is that artists today will be influenced by the artists who have come before. Smart’s oeuvre is a very specific and influential one, but she is not the only artist to explore the practice of femmage, Schapiro was one of the key artists who pioneered it in the early 70s. Given Kate’s progression in recent years and from how I have heard her speak about her work, she is aware of the artists and the art history around her. Emerging artists should be encouraged to engage and situate their work within a framework of artists whose practices have parallels or crossovers with their own. Blatant assumptions of ignorance on the artist’s behalf, or even the gallery or curator who selected the work, is not critically constructive. I’m glad you mentioned Kara Walker, because her work perfectly illustrates the point. There are clear similarities to Sally Smart’s work there, and it would be easy to make a case for influence (although the dates could make it tricky and the influence could just as easily gone the other way) But either way, it doesn’t really matter who influenced who in this case as the work is sufficiently different. They each have their own clear direction and distinctive style. So, while I’m very pleased to hear Kate S has acknowledged the influence of Sally Smart, I do have to admit I fail to see how she has taken this interest in a clear new direction, which, in my opinion (such as it is) is exactly what she needs to do. And I haven’t assumed ignorance, nor accused anyone of plagiarism. The entire theme of the piece is giving artists the benefit of the doubt. Thanks for your comments. It’s nice to have a good old-fashioned heated debate! Its good that you bought up an issue like this. I must say I would have liked to have seen a little more in-depth critical analysis of the MOP work and its conceptual concerns in using Kate Scardifeld as an example for your opinion piece. While there is no doubt these artists share an aesthetic – something Im sure Kate is aware of – perhaps even chatting to the artist would have been more helpful than asking rhetorical questions that are bordering on nasty/insulting. I think it is interesting that my comments have been construed by a few people as “nasty”, when in fact, I’ve gone out of my way not to be nasty at all and to give the artists the benefit of the doubt. I think this interpretation of the asking of critical questions as “nasty” attacks is indicative of our culture, which finds criticism in general quite confronting. We just aren’t used to it. Most reviews are actually pre-views, and (with a few exceptions) people tend to only say nice things. Another thing I’ve noticed, which is part of the same issue, is that people are very hesitant to enter the debate. This time round I’ve received MANY personal emails congratulating me on this piece and offering support and or agreement, but for whatever reason, these gallery directors, academics and artists weren’t willing to put their names to the discussion. It seems speaking out, daring to say, “The emperor has no clothes!” is still considered NAUGHTY at best and at worst NASTY. I too am familiar with the work of Kate Scardifield and attended the recent exhibition, The Whole and the Sum of it’s Parts. While I feel strongly that we should be able to engage in an open dialogue on all art forms as patrons and artists alike, I feel that any dialogue should not be reductionist or self-entitled in nature but should be undertaken in the spirit of inquiry and with an appreciation for artist’s awareness of the subtleties of any number of influences that invariably inform their work. Anyone who read the accompanying essay in the catalogue, The Culture’s of Dissection by Fae Brauer, or anyone who has heard Kate discuss her work, could not fail to acknowledge that Scardifield is very aware of the work of her contemporaries and still has a unique voice in this oeuvre. I, for one, find Kate Scardifield’s work to be dynamic, thought-provoking and beautifully rendered. I tend to think the work should “speak” for itself independent of the artist or catalogue essay, but that’s just me. I’d also like to say, even though all publicity is good publicity so perhaps Kate doesn’t mind too much, I’m more interested in the issue of “familiar” work in general than just this one example. This just happens to be the example that brought the issue to mind. As I said before, it is by no means the first or the worst. A new exhibition of Sally Smart’s work opened last week at BREENSPACE..